Despite bottoming real estate markets, rallying stock markets, months of green shoots and some general optimism on the economy, many believe the misery in real property is still not over. 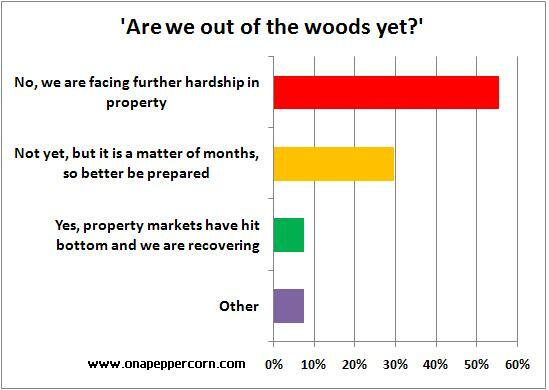 On last week’s poll ‘Are we out of the woods yet?’, more than half (56%) of the respondents voted ‘No, we are facing further hardship in property’. Another 30% voted ‘Not yet, but recovery is a matter of months’. Only 7% were of the opinion that property markets have hit bottom and we’re recovering. Other responses: 7%. Thanks to all respondents for taking the time to vote! With just 27 responses, this surely is a limited survey. But because of the quite targeted, informed audience this blog attracts, I value the outcome. The outcome forced me to take another look at my own opinion of things. Have I become to positive too soon? Will there be a second, maybe more severe, hit of the real estate markets? Have banks been covering too many clients for too long? Will demand prove to be too little, due to limited amount of capital, in order to clear the market at prevailing prices? Will prices drop even further? When will we finally see these really interesting investment opportunities come to the market, that we have all been waiting for? Hey, and how about tenants? Will they continue paying the rent, or request for another holiday? Is it the low interest rate that is keeping it all in one piece? And when is all this to change? Please, let me hear your views on the subject. A valid question could be; where are the fundamentals of the stock rally we have seen the latest months? To be honest, I can’t find any… Therefore we can expect another (even lower?) bottom which will cause the REI-market slowing down even further or at least postpone some recovery. Anyone else?